Are you a privacy lover? or you just want to make your phone more secure from unwanted use? If yes then i have brought to you “Top 5 Screen Lock Apps For Android“, which you can use to lock your android screen and protect it from unwanted use with cool style. I know you are reading this article to know about some cool and attractive screen lock for your android device. It looks more attractive and cool, when you have many innovative features in your phone’s screen lock. The screen lock about which we are going to tell you in this article are not only lock your android device’s screen, but also these lockers gives your device a good lock screen look and more features to utilize. The lockers are allows you to show notifications for your favorite applications on your device’s lock screen, shows times, set different lock screen and many more features. So when you download an screen lock for your android device, the reason is not only locking your phone’s screen because you can do that with your phone’s inbuilt pattern or other locks. But screen lockers applications gives you more attractive and cool features, which make them worth to install in your android device. So let’s choose the best screen lock application for your android device from the top 5 screen lock apps. 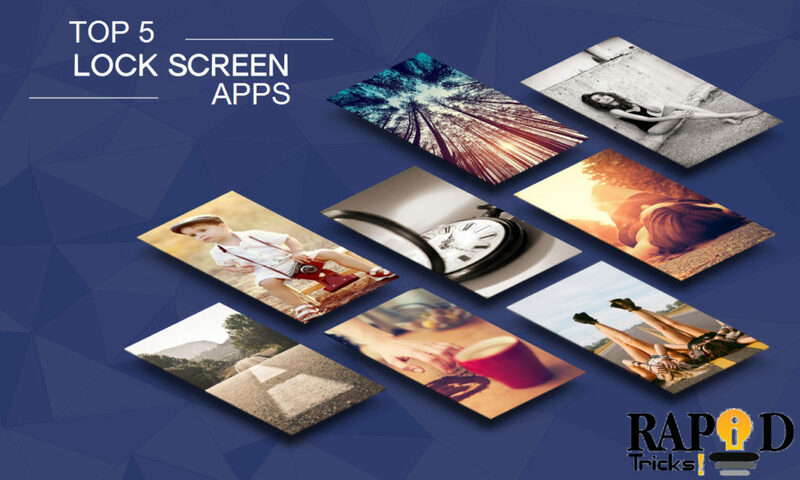 The list of top 5 Screen lock apps for android is given below, we have selected best lock screen applications for your android device with highest customer ratings. So let’s see the best screen lock applications for android. CM Locker is the best screen locker for your android device, the lockers not only secure your android device but also gives you the additional features. If you download the CM locker for your android device, then you will not need to download apps like weather forecast, Battery saver, App killer, Lost Phone tracker, etc. Because these all features are included in the CM Locker application. Now let’s see it’s main features. It includes Phone Booster for your android device. Power saver of your android device. Notification reminder of different applications on lock screen. Handly Toolbox (Flash light, Calculator, brightness, recent apps etc.). Camera Shortcut to snap a picture fast. The Screen lock app is also very good lock screen application for your android device, the application provides you device switch on/off shortcut to on or off your device easily. The use of power button frequently may damage it, so in this application you have a shortcut key to on or off your phone easily with one touch. Provide adjustment of the opacity of floating shortcuts. Vibrate your phone when locking. Floating shortcrust are auto return to lock position. You can select icon from the picture on your device. You can adjust the size of floating shortcuts. The application provides you lock screen with circle photos, this application contains many type of locks such as patter, pin etc. The application is very easy to use and looks attractive. let’s have a look on the features of Lock-screen application. You can set a password with numbers. Easily add your images into the buttons. High security, prevent your phone accessing without password. Work well on both phones/tablets. It also support keypad with a circle shape. This is the most powerful lock screen application with live wallpaper themes, it provides you different attractive lock screens for your android device. The application allows you to customize your lock screen notifications, so you will be able to select which application’s notification you want to see on the lock screen. Easy Notifications (cut down on the number of times you need unlock your phone). It provides you DIY lock screen editor. The application also provides you the app lock security. Well designed wallpapers and themes. Prevent your all applications from unwanted use. This is an amazing lock screen application with such an amazing feature, with this feature your password will be change over time. When someone see your password that time you may want to change it to secure your phone. But changing password frequently and thinking about new password again and again is not a good idea. So with this application your password will be change with the time so no one will know your password except you. You can choose your own lock type. Customize wallpapers for your lock screen. You can hide application icon with this app. The app will capture the intruder so you will know who tried to access your phone in your absence. Above we have told you the best lock screen applications for your Android device, if you have any query related to the article then don’t forget to tell us in comment box. If you like the article then please don’t forget to share it with your friends on social media and show your support to me. Stay connected with me for more informative and cool article and tips&tricks of technology.